Tonight, as a pre-launch of tomorrow’s registration opening, I’m hosting a special chat on twitter called #outrunchat, where I’ll be hosting an hour-long chat about running, training, and racing! Anyone is free to join, and as I’ve mentioned in the graphic, one person will win a prize pack including, but not limited to, nuun and a pair of Sparkle Athletic Shwings! Never joined a twitter chat before? Well, it’s easy! 2. If you aren’t already, follow me at @outrunmonorail, so you can see the questions tweeted out. 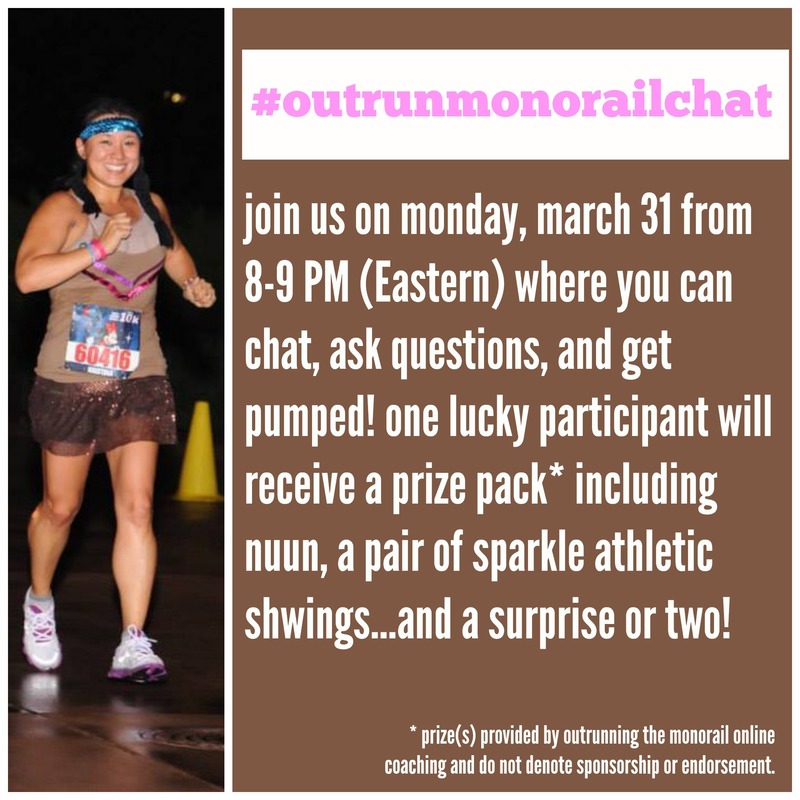 Optional: If you have a program like tweetdeck, you can set up a column that follows #outrunmonorailchat. This way, you can see who’s interacting and maybe even meet some new pals! Well, I think you’re a winner just for joining us, but to be eligible for the prize pack, all you need to do is answer AT LEAST one question during the chat (again, 8-9 PM Eastern). Winner will be announced tomorrow (Tuesday, April 1) on this blog post and will be contacted via twitter. Hope to see y’all there! And as always, please feel free to leave any questions here…or tweet me! Glad I got to join in, even if I was late. Hope you’ll do another one soon!